Almost 700,000 people said their main employment was on a zero-hours contract, a jump of 111,000 on the previous year, according to a report out today. The analysis of zero-hours contracts from the Office for National Statistics (ONS) found that 2.3 per cent of people in employment surveyed between October and December 2014 were on a zero-hours contract, up from 1.3 per cent over the same period the year before. The survey of businesses found that there were around 1.8 million contracts that did not guarantee a minimum number of hours where work was carried out in the two weeks beginning 11 August 2014. A person on a zero hours contract worked on average 25 hours a week, according to the survey. 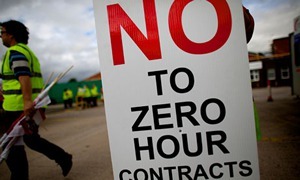 However a third of those on a zero hours contract (34 per cent) wanted more hours, compared with just one in 10 (10 per cent) of those in other employment. Those on zero-hours contracts were more likely to be women, in full-time education or under-25 or 65 and over. Zero hours contracts are most heavily concentrated in industries with low average wages, such as accomodation, food and retail (HT: New Policy Institute). Zero-hour contracts aren’t ideal, but they’re better than being unemployed. The idea that many people have that an “ideal” job is full-time, secure 40-hour-week is outdated. As this article says, zero hour contracts are concentrated among women, the very young and very old, for whom full-time employment isn’t always viable. Definitely, exploitative contracts should be condemned, but there’s no need for a condemnation of all such contracts, or otherwise those who condemn them should put forward a better alternative. Zero hour contracts are not better than being unemployed. This is another case of Work Does Not Pay. The London Dock Strike back in the 19th Century was against zero hour contract and fought and won a basic working day for fair pay, because the cattle market choosing was starving men trampling each other each day in the hope of a hour’s work. Labour alone cannot win a majority. Labour struggle only neck and neck with the Tories. UKIP and the Tories will hoover up the gone-party, the Lib Dems. Zero hour contracts means no food money and is another source of families going to foodbanks (bulk of poor are in work). The benefit system is lost to people on zero hour contracts, as below certain working hours a week and pay, National Insurance credits are not gained, so no welfare and nil state pension in the future. Today 1 year NI contribution / credit gains some pro rata state pension. From 2016, a minimum of 10 years NI credits / contribution history will be needed to get any state pension at all. For the millions of poor, the state pension is the sole food money in old age. They will have neither private nor works pension provision. Because otherwise, the Tories will bring about massive social unrest (none of which at the moment is reported in the news yet is occurrring more and more). If Zero Hour Contracts are such a boon to the working pleb, they should be extended to include the under-employed `honourable members’. If this means pay just for the 15 minutes at 9am, and 30 minutes at 10pm, spent in The House of Thieves, then so much the better. After all, they are apparently not `employed’? Do you know what a zero hours contract is? It seems incredible that the number of people on zero hours contract are included in the figures which the Tories claim are in full time employment. The problem is, as is likely the case with many of us, none of those parties (the disorganised left), will appear on my ballot paper, so I’ll have only one option, either vote Labour or spoil my ballot. I have three jobs. All zero hours contract and I still do not work full time each week (well maybe occasionally if I am lucky). The stress of juggling them all so there is not a clash. That one employer does not know about the other jobs. That I get home to have enough sleep before starting up agai in the morning to see if I have any work. And this is supposed to be the way forward? I look forward to the summers when I have no work at all and I have to sign on. It takes 6 weeks before they sort out my claim and by that time summer is over and I am back to work. The doctor has just signed my off work for 3 months but I cannot stop as if I do not work I do not get paid. I hate it. Sorry zero hours should be banned. And people on workfare are not counted as “unemployed” or economically inactive either. It’s ridiculous. The definition needs to be clear. For example, technically the contracts I do at Universities are zero-hour. Technically. In reality, I am offered a set number of hours, for a set period. Even contracts of this type should have a higher minimum, IMO – like, oh, the living wage. Yes! That’s why I question anyone who seems to think that these ‘contracts’ are in any way acceptable. Hence support for voting reform.